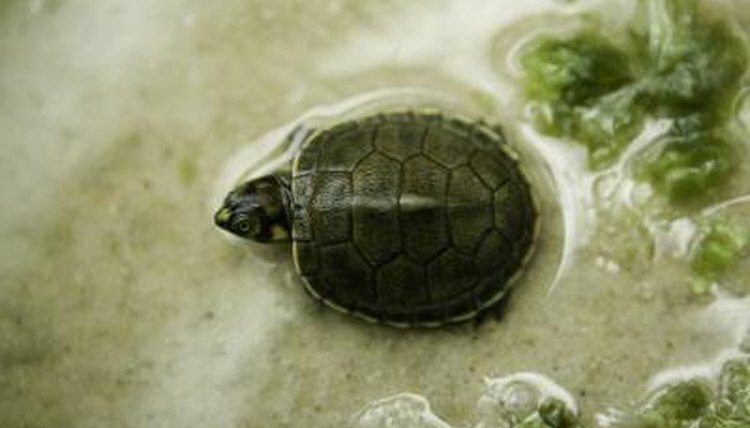 Many freshwater turtles -- often called terrapins -- are sexually dimorphic in lots of ways, making distinguishing between males and females straightforward. From species to species, the best measure of gender varies. But by investigating a turtle’s claws, tail and plastron, you can usually discern gender of adult terrapins. Immature turtles of both sexes are similar in appearance and cannot be easily distinguished until maturation. You can determine the gender of many terrapin species -- especially sliders (Trachemys sp.) -- by observing their claws. Juvenile and mature females have relatively short claws, while mature males have very long claws. The males use their clawsto “flirt” with the females -- males will swim in front of females and test their receptivity by tickling their cheeks with the claws. If a female is receptive, the male will use the claws to hold on to the female's shell while mating. Male terrapins usually have longer and thicker tails than females do. Additionally, males' vents are located closer to their tail tips than females'. This is the most consistent characteristic of males, maybe the only obvious clue in some species. The plastrons -- or lower shell surfaces -- of older male terrapins are often convex, while females have flat plastrons. This concavity allows males to better mount females while mating. This trait is more obvious in species with highly domed shells.